Tip Top Foodservice has launched Australia’s first nutritionally complete, soft white bread: The One. With extra fibre, added vitamins and minerals and a lower GI than regular white bread, The One allows foodservice professionals to satisfy customer tastes and nutritional requirements with a single bread. Tip Top Foodservice Executive Baker Wade Ashley said The One was just the latest innovation from a company which has spent half a century perfecting daily fresh bread for the foodservice industry. 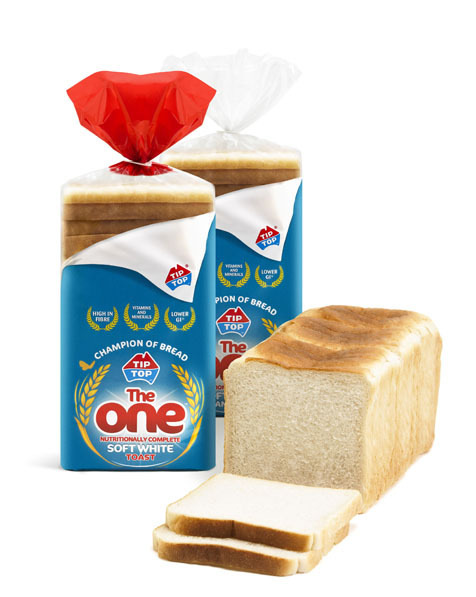 “We spent over 12 months researching and developing The One, a white bread that will deliver foodservice professionals across the country a highly nutritious and sought after product,” he said. Tip Top The One meets the Department of Health and Ageing’s voluntary salt targets for bread, as well as both government and independent ‘Green’ canteen guidelines, promoted as the best choice for menus in the foodservice sector. It contains no artificial colours or preservatives and is suitable for vegetarians and vegans. Australasian Sandwich Association Executive Director Graeme McCormack said foodservice professionals need easy access to products which are high in fibre, lower GI and reflect changing community and customer needs. “‘The One’ aims to satisfy both customer tastes and nutritional requirements – and for that Tip Top should be applauded,” he said.